Sioux City, Iowa, being right in the middle of the country, is a great starting point for a trip, and Windstar Lines can assist you in getting anywhere you want to go in the United States and Canada. We are a family owned and operated business with a strong focus on our customers. We want to get you where you want to go safely, in comfort and in style. Our drivers are the very best in the business. They are required to meet all state and federal guidelines, but we also make sure they are trained to our standards. Our equipment is also the most updated in the Midwest. We have all the way up to a 56-passenger motorcoach, even offering a 28 person VIP sleeper coach. There is an option for any type of trip you might plan, and our staff can help you make that plan for your next dream trip. 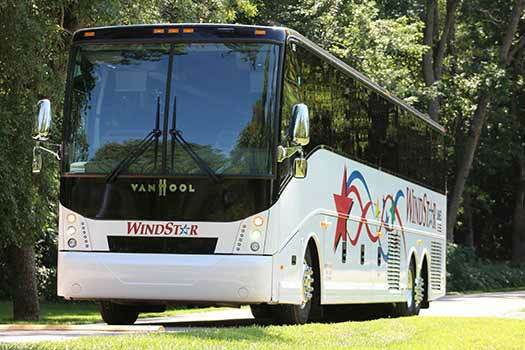 For the best motorcoach and bus rentals in the Sioux City area, or in Nebraska, Wisconsin, Illinois, or Minnesota, count on our team at Windstar Lines to get you there. Customer service is not just our priority, as we say, it is our mantra. Call us today to let us help you plan your next trip, and to get a free quote. We have accommodations for any size group - weddings, church groups, business outings, school functions, and casino trips. You name it and we can assist!